Some vehicles have a lot of options when it comes to different parts of the vehicle. 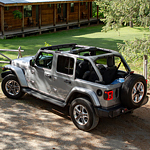 The Jeep Wrangler at Courtesy Chrysler Dodge Jeep Ram is one of those vehicles that allow you to make adjustments and also choose the features that the vehicle is going to come with in order to make adjustments to your experience. Among the things that you can choose is the type of top that you are going to have on your vehicle. You can choose a hard top or a soft top. There is also the option of the Sky One-Touch Power Top for the vehicle. You can also choose the type of doors you can have in your Jeep Wrangler. You can choose whether you can have full doors or no doors at all for an open-air ride. When you take the 2018 Jeep Wrangler for a test drive, you will get to explore your options.